Another twitter chat celebrating National Disability Employment Awareness Month! On October 28 from 2:00-3:00pm ET, join the Equal Employment Opportunity Commission for a discussion of the role of the federal government as a model employer of people with disabilities. 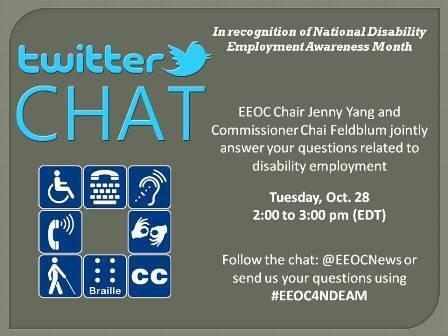 EEOC Chair Jenny Yang and Commissioner Chai Feldblum will answer questions during the hour-long chat. “As a long time devotee of Twitter, I am thrilled to have an interactive discussion about what the EEOC is doing, and what more it can do, to help people with disabilities find and retain good jobs in the federal government,” said Commissioner Feldblum. Submit question using #EEOC4NDEAM. The EEOC invites queries regarding the hiring, promotion and retention of people with disabilities in the federal government and suggestions on how agencies can increase the number of people with disabilities in the federal workforce.